In manga, "fan service" refers to titles that go out of their way to give fans exactly what they want — to hell with the consequences for storytelling and character development. Springsteen and I is fan service writ large. A film in name only, it's really just one giant super cut of Brice Springsteen fans upholding the Boss's legend as "The People's Musician," narrative be damned. Fans submitted video testimonials preaching the gospel of Bruce and what he and his music have meant to them. Their stories touch on the sense of community, fraternity, comfort, excitement and lust that Springsteen's music stirs in them, how his music has soundtracked their lives through good times and bad, and how brief interactions with the man himself — on stage or in the street — bring them closer. Baillie Walsh, best known for directing the Oasis doc Lord Don't Slow Me Down and music videos for artists like Massive Attack and Spiritualized, assembled the footage, highlighting more than a dozen fans' stories. Interspersed are concert clips that coincide with their tales, often from the specific shows these fans attended. They range in quality from grainy cellphone footage to hi-def clips and are really the highlight of the movie, particularly the deep archival stuff from the '70s. 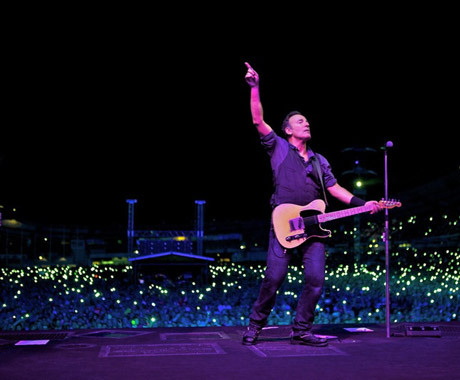 But it's unfortunate that so many of the fans featured have stories from the E Street Band's postmillennial reformation; Springsteen & I could benefit from more tales from the era when the Boss's legend was still being written. Fandom is a curious phenomenon. A unique exchange occurs when a fan buys a concert ticket or an album. Their dreams and experiences get mixed up with those of the artist. Expectations are created that the artist has to live up to. Springsteen knows this all too well, and younger artists like Pearl Jam and the Dave Matthews Band have picked up the way he's handled this careful dance. This is fertile material for exploration and given the subject of this doc — the relationship between Springsteen and his fans — there's no better place to do it. Unfortunately, Walsh leaves the talking to the fans, who prefer discussing their own personal experiences to contemplating the nature of their obsession.